, Losing a true companion is never easy, but they each leave a legacy of special memories. Jazzy is Blue Eyed and Polled! We lost Jazzy March of 2018 during kidding due to a uterine torsion. (twisted uterus) We will miss her greatly! "Jazzy" was our first blue eyed and polled doe. We were very lucky to have purchased this flashy little doe from Julie at W4 Caprine Pursuit. She was also Moon spotted so we had hoped to get lots of color in her line. Not only was she polled and blue eyed but she was such a sweet little girl. 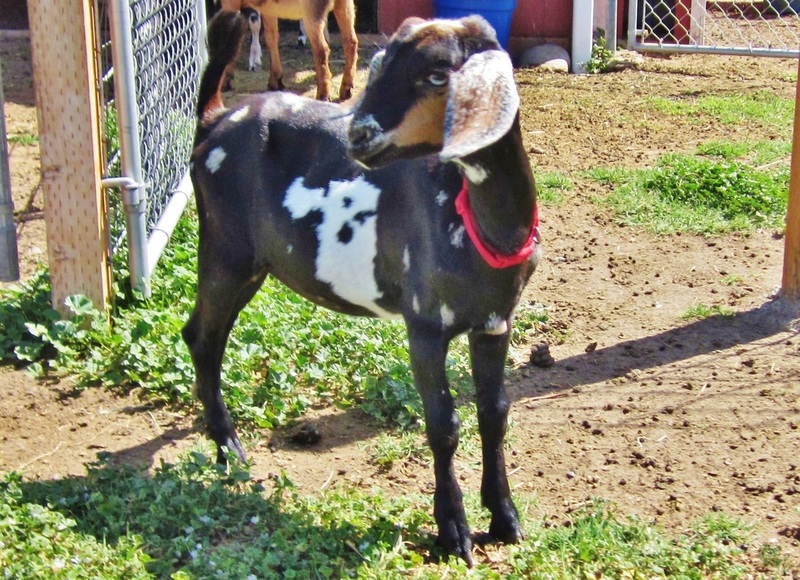 It is never easy to lose any of your goats but some years just seem to be worse than others. This has been a very difficult year for Laz E Acre. We did retain Jazzy's Son, Levi, from last year and are hoping to breed him to a few of our girls next year to keep the polled and blue eyed genes. Due to a terrible accident, we lost "Summer" just before she was bred in 2016. She was a lovely doe that gave great promise in her milking ability as well as having a very lovely and well attached udder. 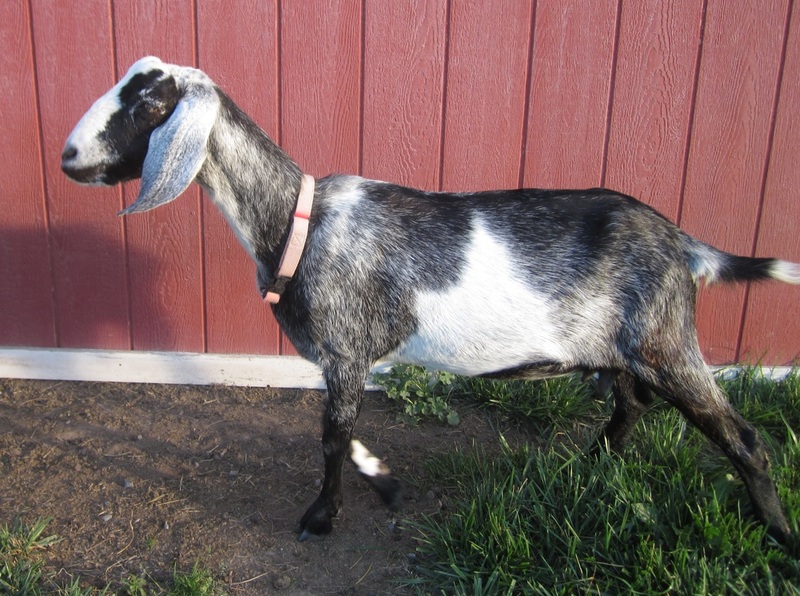 She had her own personality, as all goats do, but you never seem to know how special that is until they are gone. She was just a 2 year old and had only freshened once with two beautiful bucks. This was a great loss to us at Laz E Acre. We will miss her greatly. "Shorty" a grandson of Frankie, was 2 years old here. We lost shorty this winter. 2017 We really miss him. "Shorty" was our 2nd generation Bantam Calico Cochin rooster. 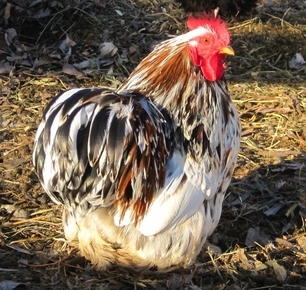 He had wonderful feathering on his legs and has the nice round body desirable in the Cochin breed. The calico coloring on his chest and back are lighter and more ginger colored than "Frankie's." He also is showing some of the blue feathering on his legs and wingtips. The blue coloring will come out in this line just as easily as the darker blacks. "Shorty" is a slightly smaller rooster and produces both blue and regular Calicos in a slightly smaller chicken. We were lucky to have kept one of shorty's sons to carry on.